Don't you hate when it is just you at table, when you are cooking dinner just for yourself, and it comes out looking so damned good that you regret that no one else is there to see it? I am always trying to show off when I cook dinner for Howard. Then when he is not home I like to branch out and cook something a little off the wall, something I think I would like but I am not sure about him. Often it is something vegetarian. Women do that a lot. If there is no guy around we just make veggie pasta or roast half a squash or something. 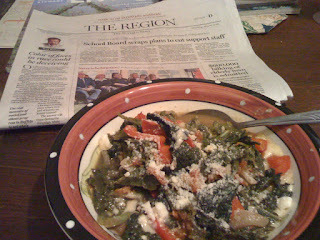 The other night when Howard had Lounge Academy I tossed together greens with red peppers and polenta. It is out of a Cooking Light magazine from a million years ago, back when Cooking Light was a decent magazine and gave you a hundred recipes an issue and all of them sounded good. I piled it all into this Dollar Tree bowl and shook on some Parmesan and son of a sea cook! It would never have looked this good if there were someone else here. I remember when I made beef stew for Leonard Pennario, thinking, if Leonard were not here it would look better. Things always look better when it is just you! Because that is when it does not have to look good. Things always turn out well when you are not trying! We're still hoping for that pennario book soon! Don't forget you can always post pics of great looking dishes on fb. I'm pretty guilty of that myself LOL.